Every Thanksgiving and Christmas, I stock up on bags of fresh cranberries. It seems you can never find them any other time of year so I get so excited and buy three or four bags and freeze some. I start out really good, planning things to make. I usually make a loaf or two of Cranberry Bread but then forget about them until the next Thanksgiving when I bring home excess bags to stockpile in the freezer, only to find last years stash. Yikes. So, when I came across this recipe as I tried to figure out what to cook for dinner the other night, I was delighted! I got the idea from Miss Edna Lewis but altered it significantly. Here is what I came up with. I served it with Roasted Brussels Sprouts & Carrots. 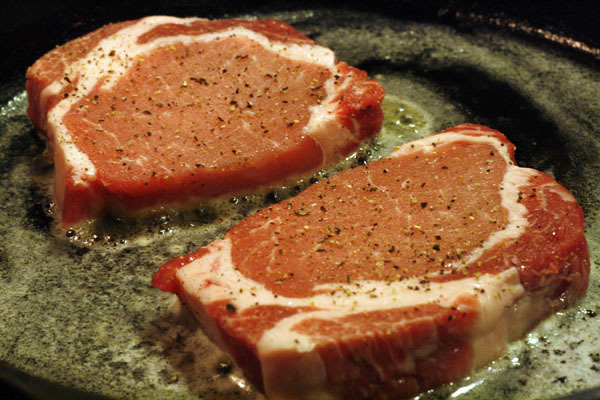 Wash and pat dry pork chops, dust with salt, pepper and flour, and set aside at room temperature. Melt butter in iron skillet over medium high heat and brown the pork chops on each side. Remove chops and set aside. Place onion in pan and cook until translucent, then add garlic, herbs, cranberries, maple syrup and stock. Cook for a few minutes. Then reintroduce the pork chops turn heat to low and simmer until pork chops are done, sauce is reduced and cranberries burst (approximately 10 minutes). I haven’t been making as many soups this winter. Maybe because it hasn’t been as cold yet. I did get a hankering for Chili the other day, though. This has been my basic chili recipe for the last couple of years. I always just sort of make it up but it almost always ends up this way. This time, I decided to jot it down so it’ll be a little easier the next time. 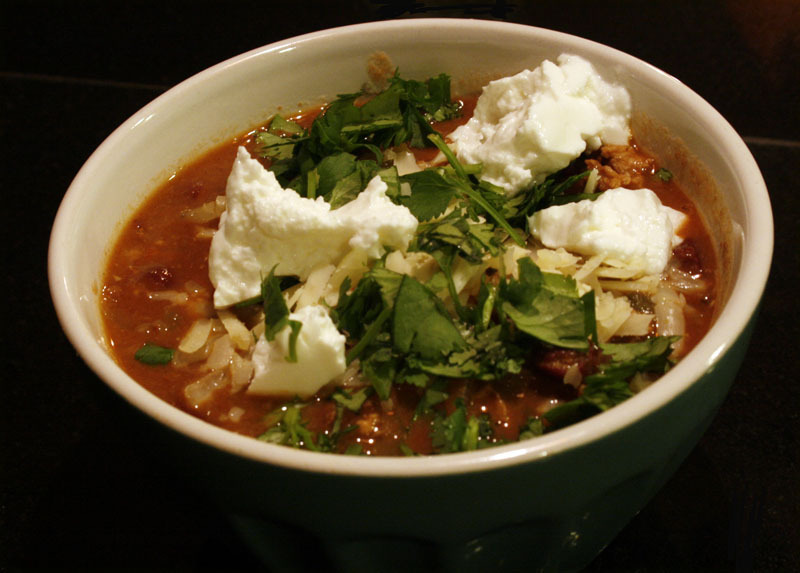 Turkey Chili with lots of toppin’s! Heat oil in a Dutch oven. Add onion and saute until it begins to soften. Add garlic and peppers. Continue cooking and stirring. Add turkey and chili powder, cumin, oregano, and salt. Stir. Add the ground cacao, tomatoes, and beans. Stir. Cook for a couple minutes and then add the stock. Bring to a boil. Reduce heat and simmer for 20-30 minutes. Serve with cilantro, cheese, and yogurt. Here’s a quick dinner idea Grant came up with one night before the holidays. It is very southern and quite delicious. Catfish has become our main fish of choice down here in the South. As far as safe sustainable seafood goes, it’s a pretty good choice for this region of the country. There are a couple of places we have found in town that we can get locally, or at least, regionally farmed catfish. (This seafood watch list is a great resource.) And, catfish is tasty! Give it a try. Preheat oven to 375. Roast pecans in a skillet or on a cookie sheet until fragrant and lightly toasted. In a little food processor, grind the pecans with the flour, spices and herbs. If you do not have a food processor, you can just chop everything extra-fine and mix together well. 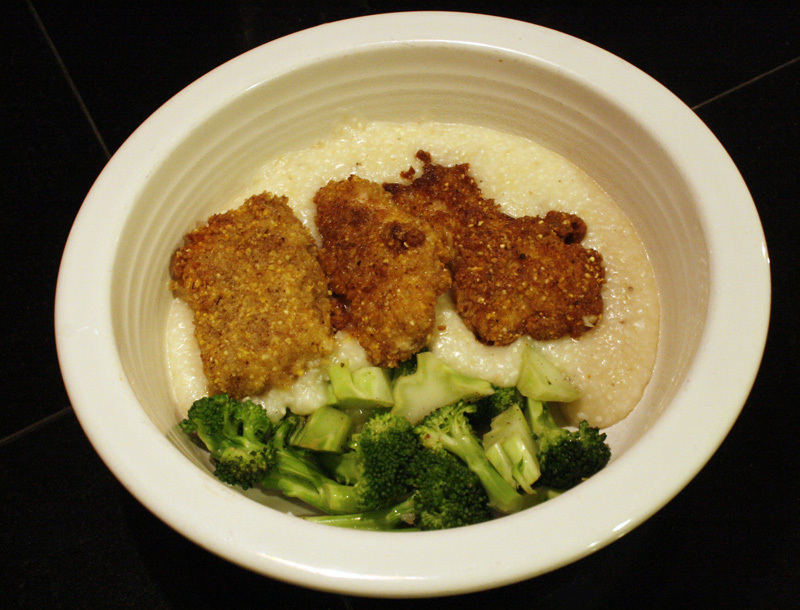 Place the buttermilk in a bowl and then soak catfish in buttermilk. Place the ground pecan mixture in a separate bowl. Place olive oil in the bottom of an iron skillet and bring up to medium heat on a stove. One by one, remove catfish pieces from buttermilk and roll into pecan mixture to coat and fry until golden brown (approx 4-5 mins per side.) Drain on paper towels for a minute and serve. One of our favorite, easy salads these last few months has been this raw kale salad. It makes me feel so good and totally energized! It is a perfect side salad for winter, too, and goes nicely alongside soups or casseroles. Place the kale in a big bowl. Sprinkle with salt and gently massage the kale a few times. Let sit while you prepare the other ingredients. 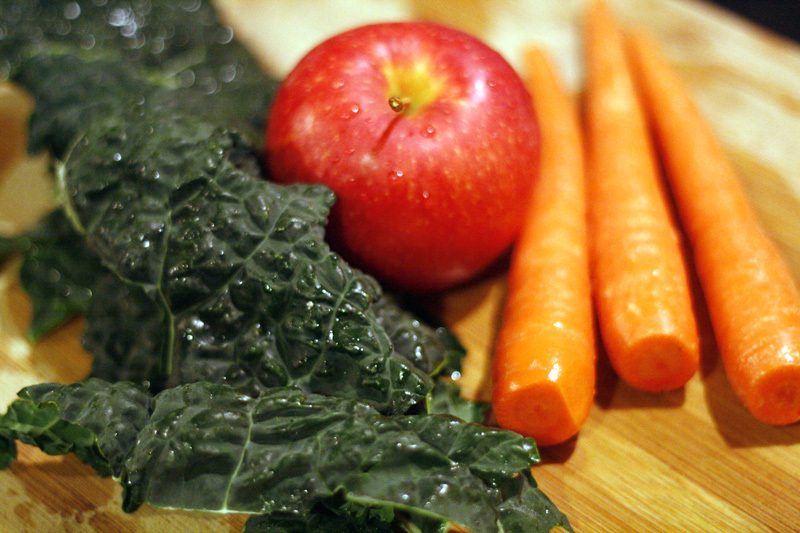 Mix in the apples, carrots, currants, and parsley. Sprinkle in a small drizzle of vinegar and oil, season with salt and pepper, and then toss the nuts on top. Also nice, is to crumble some blue cheese on top. I have a few other recipes for favorite greens coming out on Dolan Geiman’s blog later this week. And if you visit, be sure to check out his newest art. 2013 might be a good year to broaden your art collection! He has some amazing pieces. I am looking forward to all the exciting music adventures 2013 holds in store. One friend of ours who has a new album coming out real soon and whose musical future I am anxiously awaiting to unfold before us is… Sturgill Simpson. 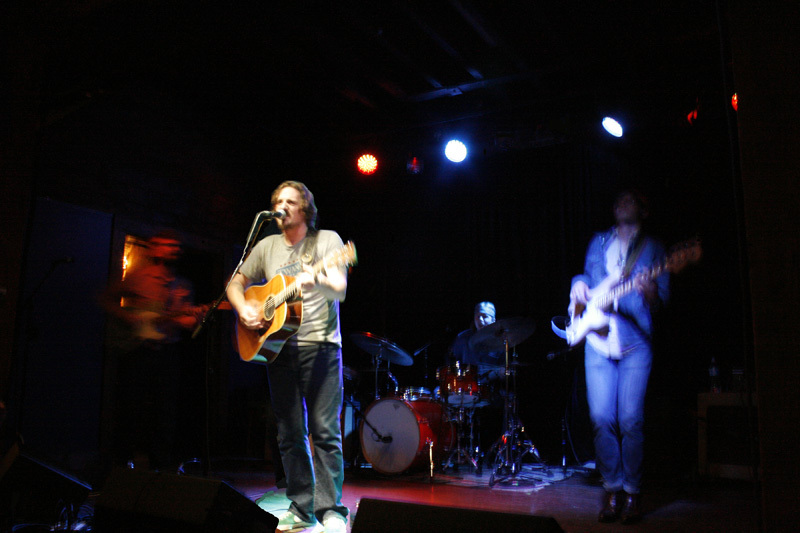 Sturgill Simpson at The High Watt, Nashville. January 19, 2013. He is from Kentucky and has this amazing old-school voice that falls somewhere in between Ralph Stanley and maybe Waylon Jennings. It is very unique and powerful. He writes some great songs, too. 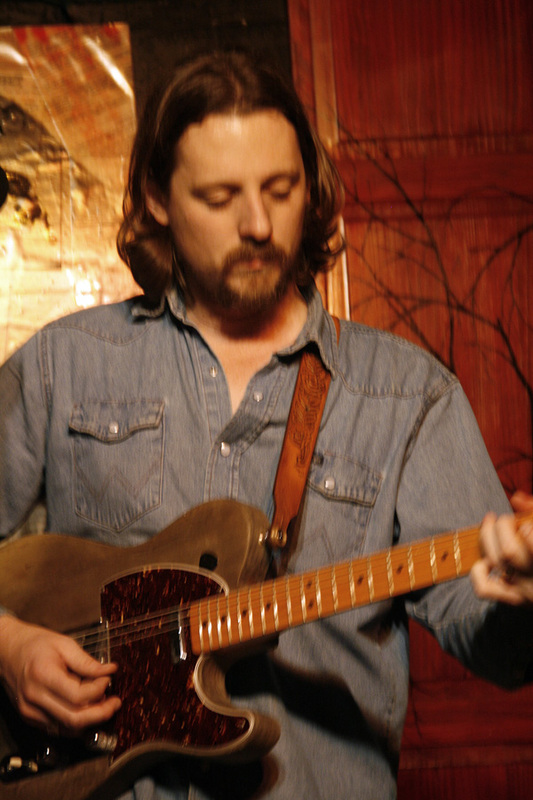 He’s opened some shows for Jamie Johnson and just recently, he and his band have opened for Dwight Yoakam. His new album will come out in June. I hate that the world has to wait so long to hear it but I’ve heard it and let me tell you, it’s worth the wait. For now, you can check out this song he has on the old youtube. It’s one of my favs. OK… back to hibernation for the winter.